A new study reveals that by 2050, 99 percent of seabirds will likely have undigestible pieces of plastic trash in their bellies. 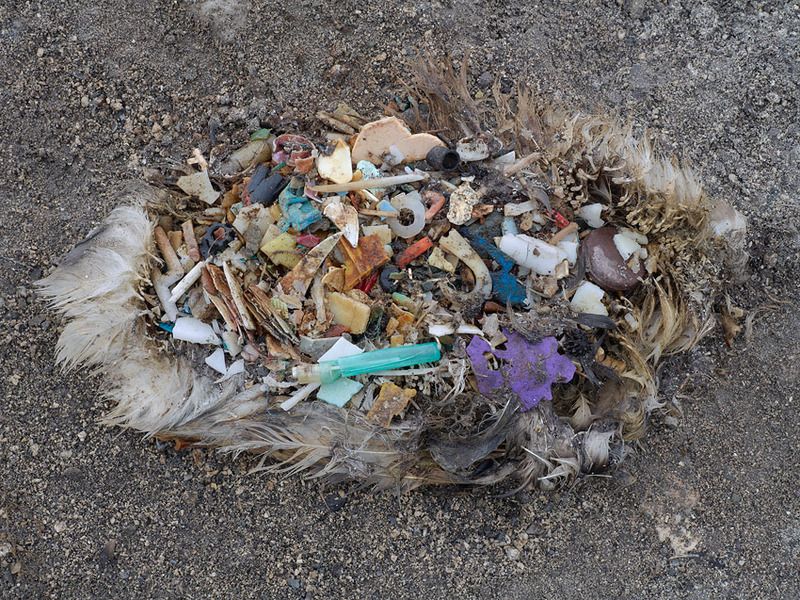 CHOKED TO DEATH ON OUR WASTE: Artist Chris Jordan has been documenting dead albatross at Midway Atoll in the Pacific Ocean since 2009. Courtesy ChrisJordan.com. The photograph has been widely circulated for years: a mess of feathers and bone, beak and bottle caps. For many, it's a shocking introduction to the problem of plastic pollution. As the image pops in our newsfeeds and the sum of its elements comes together in our minds, a single thought hits hardest—we did this. While artist Chris Jordan has been collecting images of birds in the middle of the Pacific, a team of British and Australian scientists has produced a report, just published in the journal Proceedings of the National Academy of Sciences. It synthesizes and dissects a decade's worth of environmental research on the impact of plastic debris on seabirds. 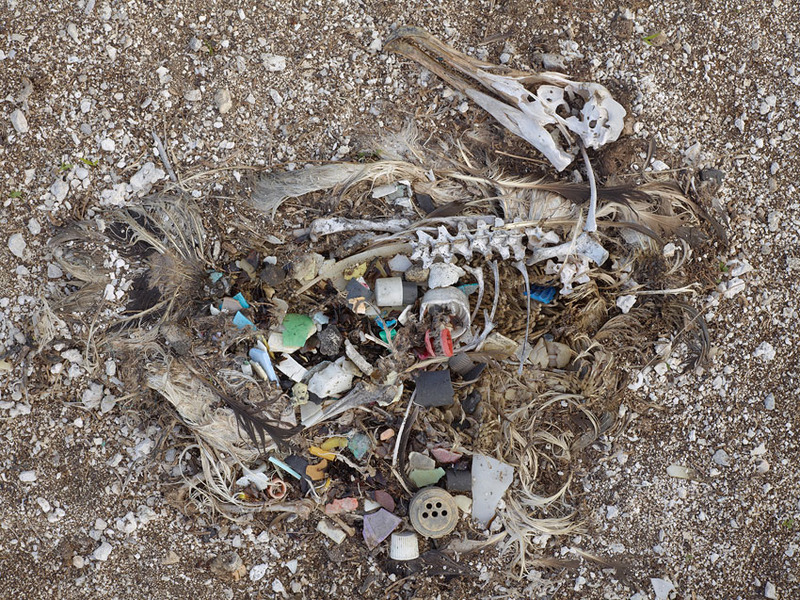 Their conclusion is that by mid-century, all but 1 percent of seabirds will have plastic in their stomachs. Unless we clean it up and stem the flow, that's the damage expected to be done by the conclusion of the first century of our use of everyday plastics. Seabirds fish and forage for food. They pick up bits and pieces of plastic floating on the ocean and on beaches, and bring it back to feed to their young. Many will end up starving to death because the foreign debris displaces room in their stomachs for nutrient-rich foods that are in their natural diets, or they end up choking. The albatross is among the largest of the flying birds, some with wingspans of a dozen feet. None of its approximately 22 species are thriving. But stemming plastic pollution would at least give them a chance. 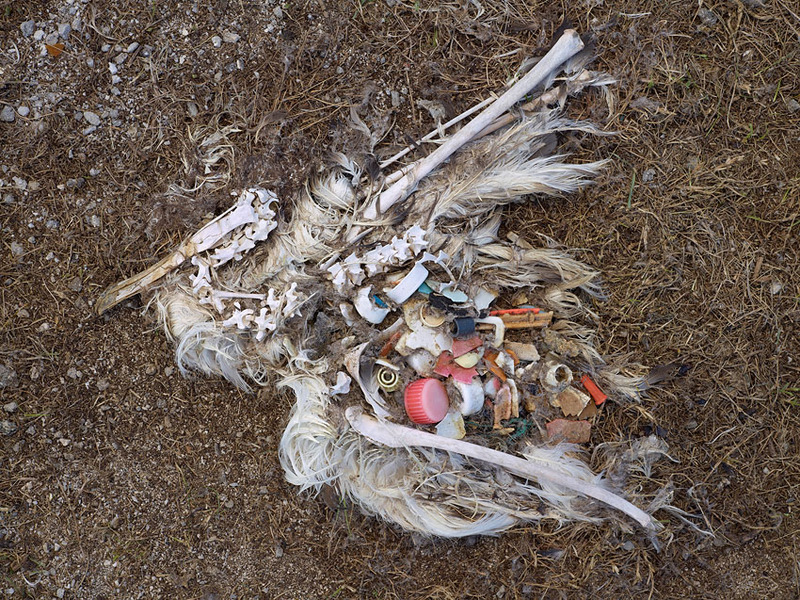 Read the report: "Threat of plastic pollution to seabirds is global, pervasive, and increasing." Newer PostWelcome to the Museum of Litter. It's a Real Thing.